Definition at line 27 of file Mips16InstrInfo.h. Definition at line 42 of file Mips16InstrInfo.cpp. Definition at line 458 of file Mips16InstrInfo.cpp. Referenced by BuildAddiuSpImm(), and validSpImm8(). Definition at line 310 of file Mips16InstrInfo.cpp. References BuildAddiuSpImm(), and llvm::isInt< 16 >(). Definition at line 466 of file Mips16InstrInfo.cpp. References llvm::MachineInstrBuilder::addImm(), AddiuSpImm(), and llvm::BuildMI(). Referenced by AddiuSpImm(), adjustStackPtr(), makeFrame(), restoreFrame(), and validSpImm8(). Definition at line 69 of file Mips16InstrInfo.cpp. References llvm::MachineInstrBuilder::addReg(), assert(), llvm::BuildMI(), contains(), llvm::RegState::Define, and llvm::getKillRegState(). Definition at line 146 of file Mips16InstrInfo.cpp. References llvm::MachineBasicBlock::erase(), llvm::MachineInstr::getDesc(), llvm::ilist_node_impl< OptionsT >::getIterator(), llvm::MCInstrDesc::getOpcode(), and llvm::MachineInstr::getParent(). 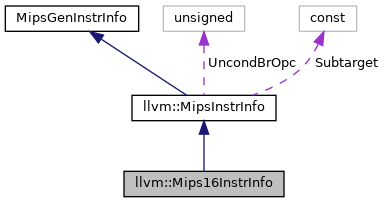 Definition at line 162 of file Mips16InstrInfo.cpp. As such, whenever a client has an instance of instruction info, it should always be able to get register info as well (through this method). Definition at line 45 of file Mips16InstrInfo.cpp. If the specific machine instruction is a instruction that moves/copies value from one register to another register return true along with machine operand and machine operand. Definition at line 99 of file Mips16InstrInfo.cpp. isLoadFromStackSlot - If the specified machine instruction is a direct load from a stack slot, return the virtual or physical register number of the destination along with the FrameIndex of the loaded stack slot. If not, return 0. This predicate must return 0 if the instruction has any side effects other than loading from the stack slot. Definition at line 54 of file Mips16InstrInfo.cpp. isStoreToStackSlot - If the specified machine instruction is a direct store to a stack slot, return the virtual or physical register number of the source reg along with the FrameIndex of the loaded stack slot. If not, return 0. This predicate must return 0 if the instruction has any side effects other than storing to the stack slot. 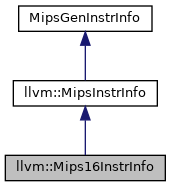 Definition at line 64 of file Mips16InstrInfo.cpp. This function generates the sequence of instructions needed to get the result of adding register REG and immediate IMM. Definition at line 324 of file Mips16InstrInfo.cpp. References llvm::MachineInstrBuilder::addImm(), llvm::MachineInstrBuilder::addReg(), llvm::BuildMI(), copyPhysReg(), llvm::RegScavenger::enterBasicBlock(), llvm::BitVector::find_first(), llvm::RegScavenger::forward(), llvm::MachineOperand::getReg(), llvm::RegScavenger::getRegsAvailable(), llvm::MachineOperand::isDef(), llvm::MachineOperand::isReg(), llvm::TargetRegisterInfo::isVirtualRegister(), llvm::RegState::Kill, Reg, llvm::BitVector::reset(), and T1. Definition at line 128 of file Mips16InstrInfo.cpp. References llvm::MachineInstrBuilder::addFrameIndex(), llvm::MachineInstrBuilder::addImm(), llvm::MachineInstrBuilder::addMemOperand(), assert(), llvm::BuildMI(), llvm::MachineBasicBlock::end(), llvm::MipsInstrInfo::GetMemOperand(), and llvm::MachineMemOperand::MOLoad. Definition at line 214 of file Mips16InstrInfo.cpp. References llvm::MachineInstrBuilder::addImm(), llvm::MachineInstrBuilder::addReg(), addSaveRestoreRegs(), BuildAddiuSpImm(), llvm::BuildMI(), llvm::MachineFrameInfo::getCalleeSavedInfo(), llvm::MachineFunction::getFrameInfo(), llvm::MachineBasicBlock::getParent(), llvm::MipsRegisterInfo::getReservedRegs(), and llvm::isInt< 16 >(). Definition at line 244 of file Mips16InstrInfo.cpp. References llvm::MachineInstrBuilder::addImm(), llvm::MachineInstrBuilder::addReg(), addSaveRestoreRegs(), BuildAddiuSpImm(), llvm::BuildMI(), llvm::RegState::Define, llvm::MachineBasicBlock::end(), llvm::MachineFrameInfo::getCalleeSavedInfo(), llvm::MachineFunction::getFrameInfo(), llvm::MachineBasicBlock::getParent(), llvm::MipsRegisterInfo::getReservedRegs(), I, llvm::isInt< 16 >(), llvm::RegState::Kill, and llvm_unreachable. Definition at line 110 of file Mips16InstrInfo.cpp. References llvm::MachineInstrBuilder::addImm(), llvm::MachineInstrBuilder::addMemOperand(), llvm::MachineInstrBuilder::addReg(), assert(), llvm::BuildMI(), llvm::MachineBasicBlock::end(), llvm::getKillRegState(), llvm::MipsInstrInfo::GetMemOperand(), and llvm::MachineMemOperand::MOStore. Definition at line 475 of file Mips16InstrInfo.cpp. References llvm::isInt< 16 >(), and llvm_unreachable. Definition at line 94 of file Mips16InstrInfo.h. References AddiuSpImm(), BuildAddiuSpImm(), isCopyInstrImpl(), and llvm::Sched::Source.